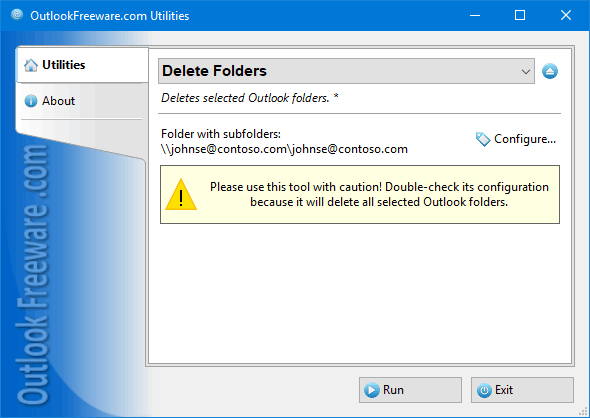 This free utility deletes selected Outlook folders and/or subfolders. To delete many folders or subfolders in Outlook, Exchange Server, and Office 365 mailboxes and public folders, simply select the folders you want and run the utility. Deleting can be safe – all deleted folders are moved to the "Deleted Items", preserving the structure. If necessary, you can choose to permanently delete folders. Key utility benefits: - Safely removes all selected Outlook folders or Exchange Server public folders at once. - Can delete all selected Outlook/Exchange/Office 365 folders permanently. - Deletes subfolders of the selected folders. - Provides the ability to run directly from Outlook or use a standalone application. - Command line support enables you to delete folders and subfolders from batch files and scripts. The command line tool allows you to delete Outlook/Exchange folders and subfolders in batch files, scripts, Windows Task Scheduler, and other scenarios. Changes: New features and enhancements.